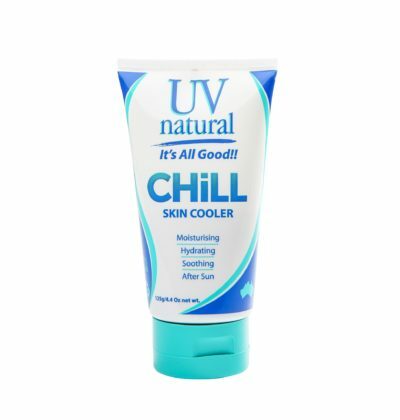 UV Natural CHiLL | UV Natural Australia - it's All Good! UV Natural Chill After sun Cooler is just that, a cool sensation of relief on the skin! Perfect for a refreshing cool change on an extremely hot day. This blend of ingredients, incorporating Witch Hazel for its astringent qualities. Apply Chill to the skin. A cooling sensation will be felt and redness will begin to decrease. Reapply if necessary. For a cool down on a hot day, apply UV Natural Chill to face and body and fan your body for a chilling experience! UV Natural Chill is a versatile product that can be used for many skin ailments. Enhanced with pure and natural essential oils and Extracts that have been used for thousands of years, and are known for a wide variety of health and medicinal uses. FB REVIEW : CHILL is AMAZING ! OMG ! The uses for this lotion are endless . I used it for an itch that that just wouldn’t scratch and a Fungal infection and it worked brilliantly. A friend of mine used it for a Bacterial infection , we were amazed at the quick results. I found that this product also had a calming effect and alleviated my irritability and stress . My son had a cold and I put it under his feet at night before bed, and he felt better in a couple of days. He is almost 13 and loves this product, because it also cleared up the pimples on his forehead. I use it for everything now and it smells divine.